Since 2003 the Michigan State Historic Preservation Office (SHPO) has presented Governor’s Awards for Historic Preservation during Historic Preservation Month. 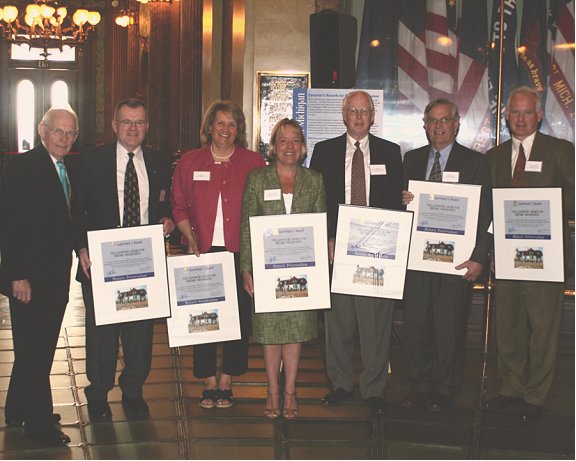 In 2010, property owners, architects, contractors, and others associ­ated with six projects gathered in the state capitol on May 5 to receive their awards. This year, the rehabilitation of the Pt. Betsie Light Station was recognized with an award. The project work has taken place over several years and is the result of the collaboration of many partners. Those partners recognized for their work are: The Friends of Point Betsie Lighthouse, Amy Ferris, Benzie County Commissioner Mary Pitcher, Charles J. Clarke, Mihm Enterprises, Inc., Quinn Evans Architects, and U.P. Engineers & Architects, Inc.
Pictured left to right: Keith Molin, Executive Director of the Michigan State Housing Development Authority (MSHDA), Charles Clarke, Amy Ferris, Mary Pitcher, John Hawley, President, The Friends of Pt. Betsie, Mike Quinn, Quinn Evans Architects, and Albert Mickalich, U.P. Engineers & Architects, Inc.